The world’s fastest growing airline, Emirates, plans to ramp up its services from China to Dubai from July. The Dubai-based airline will upgrade its second daily flights from both Beijing and Shanghai from a B777-300ER to an A380. This will significantly increase passenger capacity out of China where Emirates also operates services from Guangzhou, Yinchuan and Zhengzhou, with each A380 offering around 519 seats. “The additional seats on the routes will support more business and leisure travel departing from and arriving in China,” the airline said in a statement. 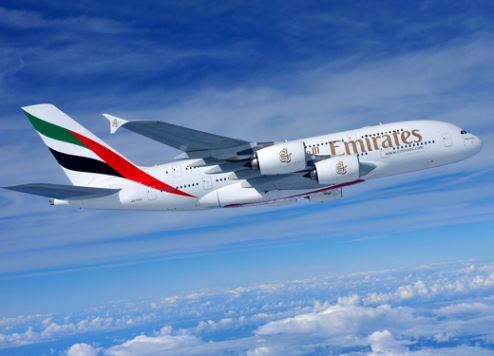 In its latest annual report, Emirates said revenue from East Asia and Australasia increased 0.9 percent to AED22.6 billion (US$6.15 billion) compared to the previous financial year. The region contributed 27 percent ($22.8 billion) of the airline’s total revenue, making it the airline’s largest market after Europe in the 2016-2017 financial year. Last May, Emirates started flying from Yinchuan and Zhengzhou to Dubai and currently flies out of six destinations in China, operating a total of 38 flights weekly on these routes. The first airline to establish non-stop connectivity between the Middle East and mainland China, Emirates launched freighter operations between Shanghai and Dubai in 2002, followed by passenger services between the two in 2004. Beijing routes followed in 2006 and an A380 was deployed on the route in August 2010. The number of Chinese tourists visiting Dubai and the UAE has rocketed over the past few years and has accelerated since November when Chinese visitors were granted visas on arrival into the country. In the first quarter of 2017, the number of Chinese visitors to Dubai reached 230,000, marking a 64 percent increase year on year. China became the fourth largest source market for tourists for Dubai after India, Saudi Arabia and the UK during the period. China has been Dubai’s biggest trading partner since 2014 and UAE-China bilateral trade amounted to $45 billion last year.